Put the chocolate and milk in a mug and microwave until the milk is steaming (but not boiling). 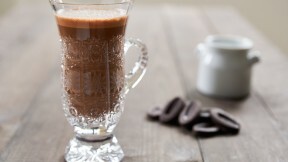 Use a whisk or hand blender to emulsify the chocolate and milk. Add shochu to taste. I like to add about 2 tablespoons.